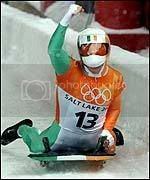 The 6th Baron of Wrottesley gave Ireland a lift at the Olympics. Steve Bunce reports. HE looked at the reporter from the New York Times with a typical lopsided smile and shook his head at the question. She had wanted to know what it felt like to be an Irish sporting legend? There was a sudden silence in the interview area. "I'm not an Irish sporting legend yet," said Sir Clifton Hugh Lancelot De Verdon Wrottesley, who was born in Dublin 33 years ago but lives in London and St Moritz. He recently married Sascha Schwarzenbach and one can only imagine the angst the priest endured the night before the tongue twisting ceremony. Three years ago Wrottesley decided to take up Skeleton, a crazy sport where the competitors slide headfirst down an ice track nearly one mile long, on a flat board with two blades and reach speeds in excess of 80 mph. On Wednesday, Wrottesley was in the bronze medal position with just one run to go – he was 50 seconds away from a medal. 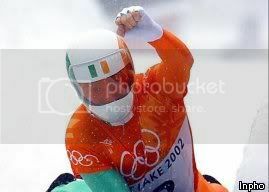 As he walked through the blizzard at the start line to prepare for the final run of the Olympics, a dozen Irish fans waved flags at the finish line. It was snowing, it was Salt Lake City but suddenly the second greatest sporting show on earth had an attack of the Roddy Doyles. "Galway loves you, Sir Clifton," a woman in the front row bellowed. Wrottesley, who is also 6th Baron of Wrottesley, hit a curve or two and finished fourth in a field of 26. Not quite a legend but a lot closer than he was less than a minute earlier and, from a personal point of view, 10 places higher than then British racer, Kristan Bromley. Wrottesley had toyed with the idea of representing Britain but he received an unfavourable welcome when he made inquiries and he decided to compete for his homeland. Off the record the Brits thought he was the latest Eddie 'The Eagle' Edwards. "I know certain national elements in Ireland might be a bit wary of me but the team here believe in me," said Wrottesley. "I'm a Gentleman amateur and I've shown what can be achieved and I just hope that I inspire young Irish athletes to take Winter sports seriously." The near-legend was educated at Eton and went to Sandhurst before a stint in the Grenadier Guards as a captain. He is sponsored by his uncle's vineyard and his skeleton outfit was designed by German fashion house Escada, perhaps best known for dressing the deceased Princess Diana. 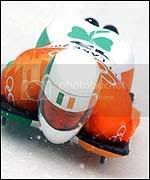 The vineyard also sponsors the two-man bobsleigh team and has raised Ir£25,000 so far in an odd promotional venture: According to Wrottesley, every time a crate of Chateau De Sours is sold the Irish bobbers and gliders receive £4. By the way, just to continue a theme, his uncle's name is Esme. "What Clifton has done is remarkable and brilliant," said Paul Kiernan, one of the two-man bobsleigh team. "At first nobody was sure about him, but he is a terrific fella and he is just one of the lads." Before Wrottesley took up skeleton racing he was known as the king of the St Moritz Cresta run, which is something his father had been back in the fifties and sixties. WROTTESLEY'S dad was a legendary bon vivant but he died when the boy was two. "My dad will be doing cartwheels in the sky," said Wrottesley. After all, the Olympic are bigger than a Cresta run and a polo match. I remember it all right, bet the National Sports Council of Ireland were praying that he didn't get a medal. Great moment, reputedly a great fella (from a friend who met him), pity he didn't get a medal of any colour (he was very, very, close). I'd have loved to have seen John Treacy's or Pat Hickey's face had he done so. As it was they should have recognised his achievement, but then neither are noted for sticking vtheir neck out to do the right thing. Wonder where Sir Clifton is today. Anyone know? still livingthe good lifein st.Moritz if he has any sense!